What are thundersticks? Thunder sticks are inflatable spirit items that you bang together to make loud noises to help cheer on your favorite team. We have many different types of thundersticks to choose from including thunderstix, bam bams, re-inflatable thunder sticks, and a one-time use thunderstick. Have your custom mascot imprint on these thunder sticks and bam bams. These thunderstix are great for fundraising for booster clubs and athletic clubs. Choose from many styles and shapes of these stadium noise makers. The loud noises made by banging these inflatable noise sticks together are great motivators for your football team, pep rally, or rally event. 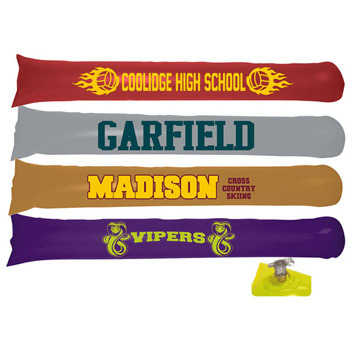 Custom printed thundersticks are great fundraisers for your booster club to sell. Everyone at a football or basketball game loves to make noise, and there is no better stadium noise maker than a pair of thunder sticks. Choose from virtually any color, including full color design thundersticks.